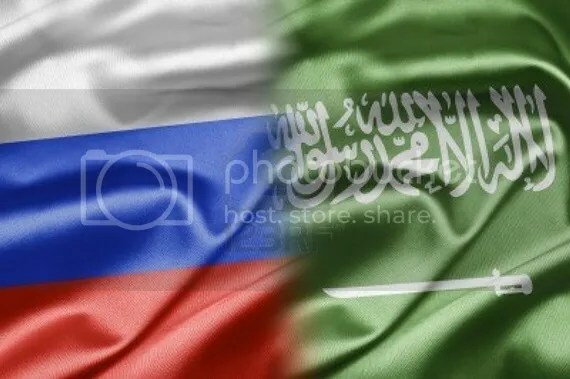 On Monday, 13 January, the Press TV columnist Finian Cunningham revealed that “Russian intelligence has now reportedly obtained solid proof that Saudi Arabia was directly involved in the twin terror attacks on the city of Volgograd. The attacks killed more than 32 people and injured over 100 others. Most of the victims were civilians. According to an informed Russian official source, reported by the Fars News Agency, Russia’s Federal Security Service (FSB) has informed President Vladimir Putin of the Saudi link to the Volgograd massacre”. Cunningham adds that the “Russian leader was warned by the Saudi intelligence chief Prince Bandar Bin Sultan during a heated four-hour private meeting back in July that Wahhabi-sponsored terrorists based in the North Caucasus region of Russia would be targeting the Sochi Winter Olympics”. Cunningham continues that the “group believed to be behind these attacks [in Volgograd] is known as the Caucasus Caliphate, led by Doko Umarov. Saudi Arabia is a major source of funds for the Caucasus Caliphate, which espouses the same fundamentalist ideology as the Saudi-sponsored Takfiris operating in Syria, Lebanon, Pakistan, Yemen and Iraq”. And according to the Kavkaz Centre – a Chechen internet agency which is independent, international and Islamic – at Sochi, the secretary of Security Council of Russian Federation Nikolai Patrushev already declared in 2010 that “Al-Qaeda’s main goal is to establish an Islamic caliphate spanning through the Central Asia, North and Central Africa and the North Caucasus. Appeals to Muslim residents in these regions to overthrow their governments are getting more and more common”. Are these current terrorist attacks on the territory of the Russian Federation proof that the Caucasus Caliphate, arguably emboldened by Saudi Dollars, now means business and plans to catapult the Winter Olympics at Sochi as a means of loosening Putin’s tight grip on the northern Caucasus region??? Or, could it be, that Russia’s Syria policy has persuaded Saudi policy makers that swift action was called for??? On 13 January 2014 then, the Iranian journalist and columnist Tahmineh Bakhtiari remarks that Russia’s FSB intelligence and counter-intelligence agency “presented documents [to Russian President Vladimir Putin], which mostly revealed multi-layer communication and cyber lines in Britain, UAE, Lebanon and Turkey. In the report Saudi Arabia was described as the control center of the recent terrorist operations. This confidential report also detailed how Saudi Arabia provided financial and logistic support to the mentioned terrorist group”. The plot clearly thickens . . .
Bakhtiari explains in great detail that “[c]urrently, there is a rift between Saudi spy chief Bandar bin Sultan and many of the Saudi [princes]. Especially from 2010 onwards, wherever there is unrest, riots, bombing and sabotage, the name of al-Qaeda and its main sponsor Saudi Arabia is present. They see Bandar bin Sultan as the main cause of many internal and external problems of Saudi Arabia. Lack of freedom of speech, repeated violations of human rights, Gender and religious discriminations are among many other problems that have caused the deep rupture among the Saudi people. Thousands of political and intellectual activists are jailed in Saudi Arabia only for criticizing the Al Saud family. Under these circumstances, Al Saud officials try to divert world’s attention from the country’s internal affairs to elsewhere and strengthen their family by supporting al-Qaeda. However this tactic is not very effective, because the 21st century is the era of the public opinion awakening and fast exchange of information. AL-Qaeda has deceived many young people with false promises to use them to promote its own agenda. In the beginning al-Qaeda was formed as part of a plan to counter communism. 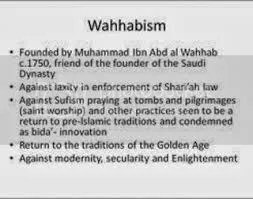 The group was used to promote Islam as a violent faith, serving the West’s interest on two fronts. Distorting the image of Islam among Europeans and acting as an ideological war against `communism. After the collapse of the Soviet Russia, the US tried to use al-Qaeda to disrupt the regional equations in Middle East, and that was their reason for not disarming them. In 2001, 9-11 attacks by al-Qaeda in New York gave the US the opportunity to carry out its plans in the Middle East. At first the US attacked Afghanistan and then Iraq to fight against the so-called origin of terrorism, which was al-Qaeda. After the US attacks on Afghanistan and Iraq, not only [did] al-Qaeda not become weak, but it also nested in most of the Middle Eastern countries and even Russia. In a move contradictory to their past slogans, the US and some Arab countries sent money and weapons to the terrorists in Syria”. Through the fog of Bakhtiari’s ideological bias and her perpetuation of the Al-Qaeda myth, the picture that emerges is one showing a hectic Saudi state, trying to use its massive petrol Dollar wealth for the benefit of the Wahhabi cause . . . 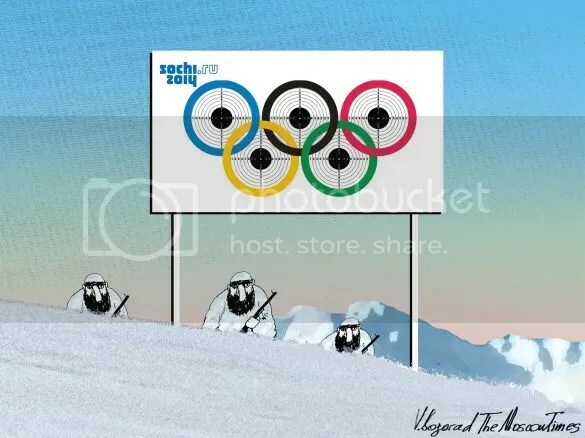 In the Moscow Times then, Vladimir Ryzhkov opines that the “threat [to the Sochi Olympics] is ever greater and more serious in light of the fact that Doku Umarov, head of the Islamic extremist group Caucasus Emirate [or Caliphate], released a video in July  calling on his followers to disrupt the Winter Olympics and ending the moratorium on terrorist attacks in Russia, including attacks against civilians. It is very likely that the Caucasus Emirate organized the series of attacks in Volgograd as a response to Umarov’s recent statements. The creation of the Caucasus Emirate has fundamentally changed the nature of armed groups and terrorist organizations in the North Caucasus. For many years before that, insurgents in the region followed a separatist ideology aimed against the ‘Moscow occupiers’. Now they have adopted the ideology of radical Islamism and jihadism. The Caucasus Emirate wants to establish an Islamic Sharia-based state in the North Caucasus and even beyond, and it has declared a holy war against all infidels. The militants refer to themselves as mujahedeen, the same name once used by insurgents in Afghanistan. The Caucasus Emirate has no definite boundaries and does not recognize the division of the North Caucasus into its current national republics. The emirate claims to be the only legitimate authority wherever mujahedeen are found. Just as he denounced the upcoming Olympics in Sochi, Umarov labeled the earlier Universiade in Kazan as ‘satanic games’ and called on the Muslims of Tatarstan to oppose it. There is information that Caucasus Emirate militants are also found in Bashkortostan and several other regions of the Volga . . . According to reports, the Caucasus Emirate has a special unit devoted to preparing suicide bombers: the so-called “Garden of the Righteous.” In the last 12 years, 46 suicide bombers — mostly women — have staged 26 terrorist attacks in Russia. These include Moscow metro bombings in 2010 and the downing of two planes in flight in 2004. Russia has suffered enormous losses from terrorist attacks. According to estimates by U.S. Caucasus specialist Gordon Hahn, from 2007 to 2012, the first five years that the Caucasus Emirate existed, terrorists staged more than 2,200 attacks that claimed the lives of 1,800 soldiers and officials along with 450 civilians. More than 3,500 people were injured”. The Kremlin-backed Chechen President Ramzan Kadyrov vowed to eliminate the Caucasus Emirate (or Caliphate) before the Sochi games got underway, but he clearly failed in his objective. Is it now up to his boss, President Vladimir Putin, to get the job done, as claimed by Press TV??? Finian Cunningham, “Russia may hit back at KSA for Volgogard attacks” Press TV (13 Jan 2014). http://www.presstv.com/detail/2014/01/13/345300/will-putin-destroy-saudi-rulers/. Finian Cunningham, “Russia may hit back at KSA for Volgogard attacks”. “Moscow claims al-Qaeda wants to include Caucasus into the Caliphate” Kavkaz Centre (05 Oct 2010). http://www.kavkazcenter.com/eng/content/2010/10/05/12595.shtml. Tahmineh Bakhtiari, “‘Russia committed to destroying al-Qaeda and terrorism’” Press TV (13 Jan 2014). http://www.presstv.ir/detail/2014/01/13/345443/russia-committed-to-destroying-alqaeda/. Tahmineh Bakhtiari, “‘Russia committed to destroying al-Qaeda and terrorism’”. Vladimir Ryzhkov, “Our Own Bin Laden” The Moscow Times (14 Jan 2014). http://www.themoscowtimes.com/opinion/article/our-own-bin-laden/492669.html.